In addition to starting our first garden this year, we have also purchased a share in a CSA. This is our second year of trying a CSA (community supported agriculture), and I'm excited to see what the summer brings. Last year, we went with Elmwood Stock Farm, a well-established local farm, and we were very pleased with the shares and the informative newsletters that accompanied each bag of farm-fresh food. This year, I decided to try another farm's CSA for no other reason than I wanted to see how other farms did it, and the one I eventually chose was Green Pastures CSA. I liked the price and the fact that it was two farms working together to produce the shares, one being Clark Family Farms which we had previously toured. And they deliver for free! Another bonus for us as last year Mr. Making It Bright had picked up our shares at his work and then the veggies sat out and got wilty before they made it home. Here is our first share. Admittedly, it has been a weird season so far with the cold temps late into spring and so much rain. They expect more bountiful shares for the rest of summer. 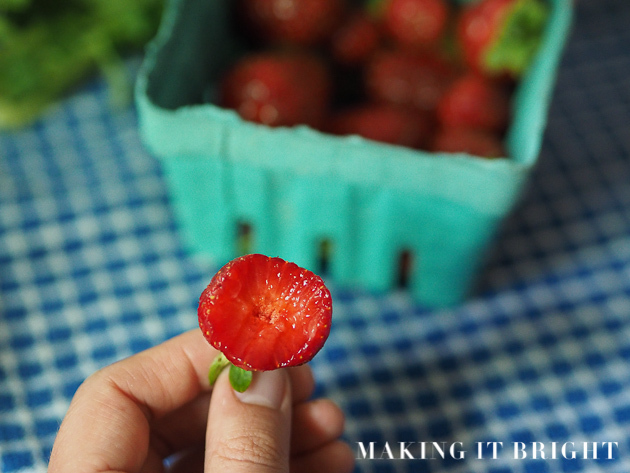 Look how red that strawberry is, inside and out. Heavenly. Totally worth cheating on the slow carb diet to have those berries. 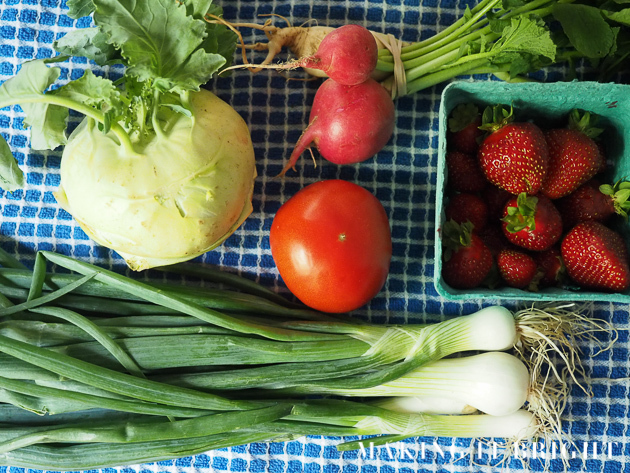 Have you ever tried a CSA?